Lately I've been having trouble with my bow suddenly losing grip in the middle and sometimes sliding (You can see happen it in this video: ) I looked at my bow and there's a spot in the very middle, roughly four inches long on the right half of the hair where rosin is not sticking at all. I tried rosining it up extra in that spot and it didn't really help. Any ideas of what I should do? I took a picture but I don't have time to import it from my phone right now. I'll post it after work. I noticed a lot of improvement since last I heard you play. Keep up the great work. I saw it. You car[bow] left the lane, jumped the median!! 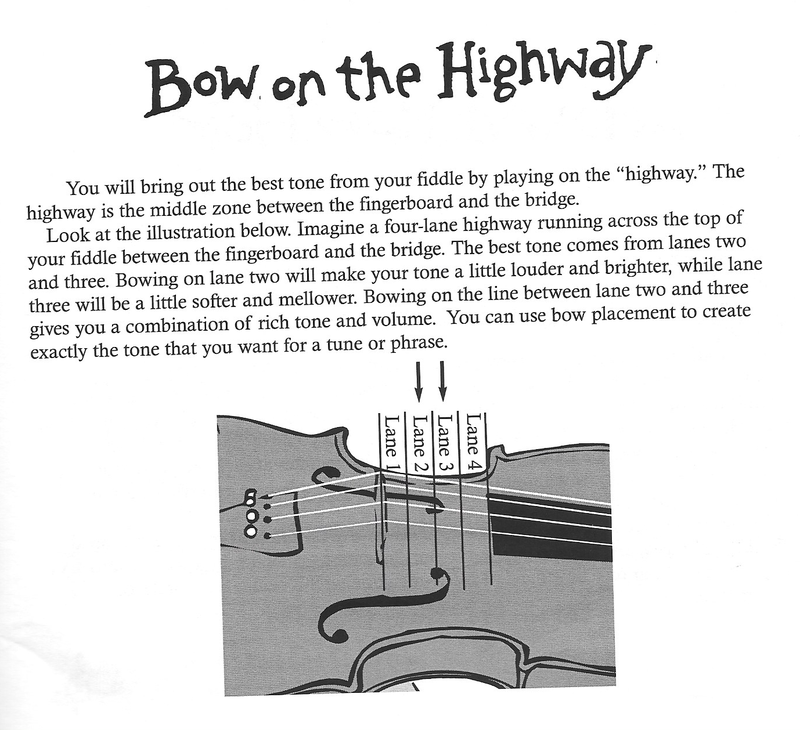 This is a picture from Brian Wicklund's Book - Bowing the HIghway. You are definitely improving!! @Schaick Lol 'jumped the median"
I looked at it closer and it seems the hair in that area is just looser than anywhere else . I think what happened was it got caught on the bow hook thing in my case and got stretched out. If im very careful with my bowing, i have absolutely no trouble with it! Ill have it looked at, but it might be worth keeping this way to force myself to get better bowing control. or... It could be bow bugs... I just found out my apartment is infested with them. I havent seen any in my case, yet, but im gonna put a cottonball soaked in cedar oil inside just in case (cedar is toxic to most bugs, as is citrus oil). You can tighten those loose hairs by using an alcohol lamp. Being very careful not to hold the hairs over the flame too long. Hobby shops should have alcohol lamps. BTW. Leave your bow in the light or your violin case open, bow bugs hate the light. I've lost the hairs from three bows by leaving them in the closed case. I took it to the shop today and they said I probably got something on it, but they couldn't tell what. They also said that its about time for a re-hairing anyway. They charge $50 and just getting a new bow same as I have now is $49. So I think I'll deal with it until payday next week and get a new one. If you like, give us a call on Monday. I might be able to help you out. Have some FM Carbon Fiber bows that have very slight defects. There's a few threads on here of how to clean the bow hair with alcohol. I'd take a paper towel and pour some alky on it and loosen the hair completely and rub that alky soaked towel on the hairs a LOT. See if that helps to clean that trouble area. Let it dry good, then reapply the rosin and see. Worth a shot. Save your money and buy a nice (even with a defect or two) carbon fiber bow from the Fiddlershop for a backup. I have 6 bows and keep playing with my FM bow almost exclusively. Scroll down to my post with description and photos. Just a thought. - when you get a brand new bow with no rosin on it, you have to rosin continuously for maybe 5 minutes to get a good base coating on the hair. Maybe that's all you need to do, since you've essentially taken all the existing rosin off. My lutiher uses ground / powdered rosin when he re-hairs a bow before using the solid. He's done three for me while I wait and watch. 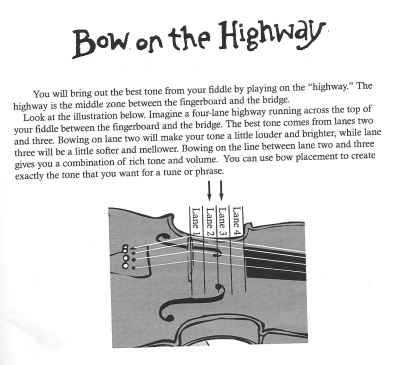 @Fiddlestix I had never heard of that. Very cool. I have never heard of ground powdered Rosin. 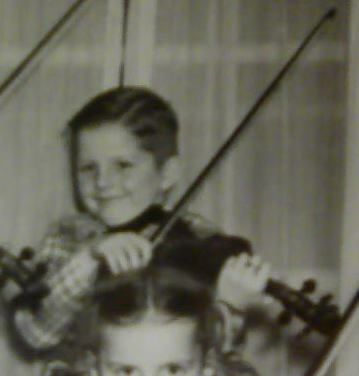 Try a little rosin powder to help season new bow hair. Only joking on that one, girl. @Jim Dunleavy Thats it! I just hadn't rosined it enough after cleaning. After roughly 3 minutes I could visually tell a difference, then after 5, it sounded fine. Thanks everyone for your help! Y'all saved me $49!